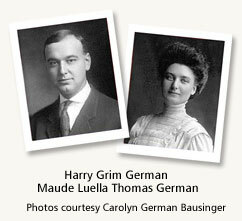 Photos courtesy: descendant, Carolyn German Bausinger with additional research by Connie Pickering Stover, March 2013. Portrait of David German is from an oil painting, about 1895. David Leedom German, Jr. at age 35, applied for membership to the Sons of the Revolution. [Click here] to see acutal application. 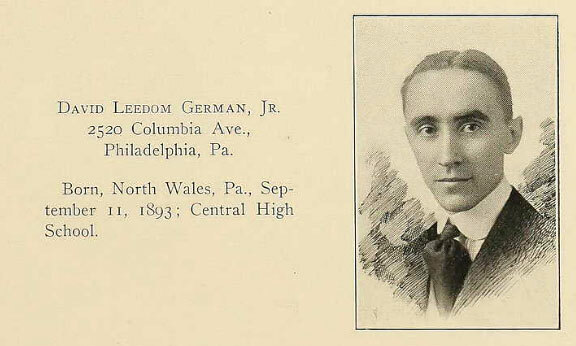 David Leedom German became a dentist and Catharine Grim was the daughter of a prosperous Bucks County farmer, David Grim, and his wife, Emma Knipe. Emma's parents were Conrad Knipe and his wife, Elizabeth Summers, of Philadelphia. Conrad was a salt merchant in the city. 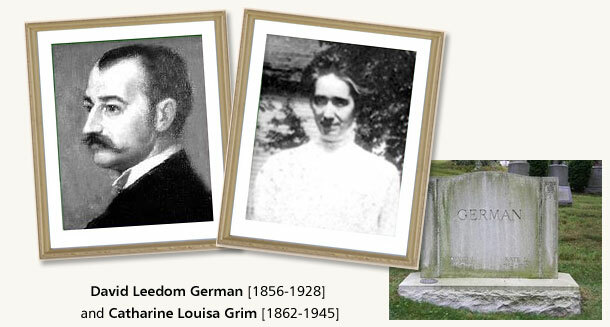 David and Catharine German lived, first, in Doylestown, Bucks County, where their first two sons were born. Next, they lived in North Wales and eventually moved into Philadelphia, where they lived the rest of their lives. My dad remembered that every visit to his grandparents there involved a dental checkup. Harry Grim German, was my grandfather. Harry was a chemist, and met my grandmother, Maude Luella Thomas, while on his first job after college. Their homes followed his work, but by 1919 they were permanently settled in Smethport, McKean County, PA, where my granddad managed a large wood chemical plant. Harold Leedom German, was my father. My mother was born Sara Marguerite Howard. They met in Washington, DC, in early 1942. My dad was a Naval Lieutenant and assigned there, while my mother had left her family in Tampa, FL, to work for a government agency. David Leedom German, III. at age 22, applied for membership to the Sons of the Revolution. [Click here] to see acutal application. According to records I [C. Bausinger] located, [David] Alexander [German Jr.] was a farmer while they lived in NJ but, when he bought the land in Newtown, appeared to be more interested in dividing the land into small parcels, building homes on them, and selling these. After Amelia died, he married Annie Hoppock, of Hunterdon County, NJ. she outlived him and returned to NJ after his death. I have a copy of Alexander's will, and a few probate documents. Evidently, his second wife could not write her name, as she signed with an X.